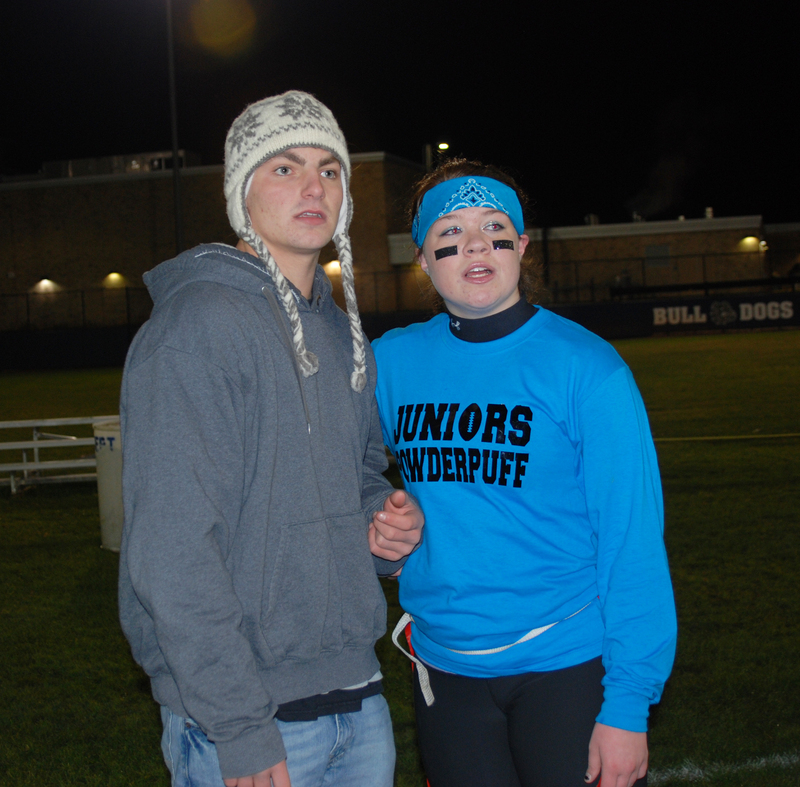 This 2013 Powderpuff game, held on Monday, Nov.25 was as close as it gets. The junior and senior Powderpuff teams battled to a 6-6 tie after regulation time. In overtime the juniors pulled off the upset by intercepting a pass and racing all the way to their goal for the 12-6 win. The complete game summary will be included in the next Veritas print edition coming out in December. 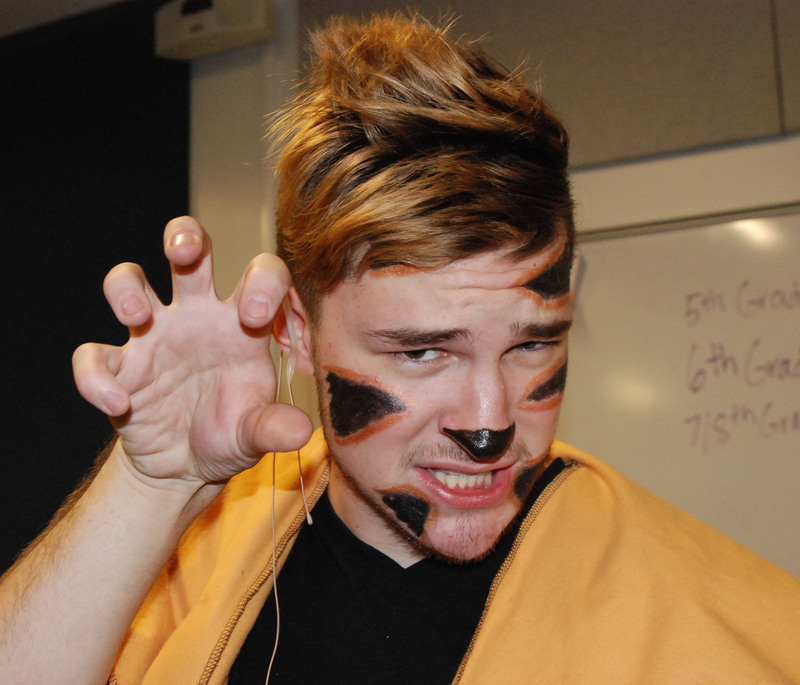 The following photos demonstrate why Powderpuff is such a highly anticipated event each November, providing the girls and guys with a night for role reversals and fun! Seven Rockland High School alumni ranging in age from 30 to 86 were inducted into the RHS Athletic Hall of Fame on Saturday night, Nov. 23, at the Rockland Golf Course. Athletic director Gary Graziano, master of ceremonies for the evening, introduced outstanding athletes from the Class of 1945 to 2001. The 2013 induction class includes two females and five males who starred in wrestling, track, basketball and soccer and led their teams to league and state championships while at RHS. 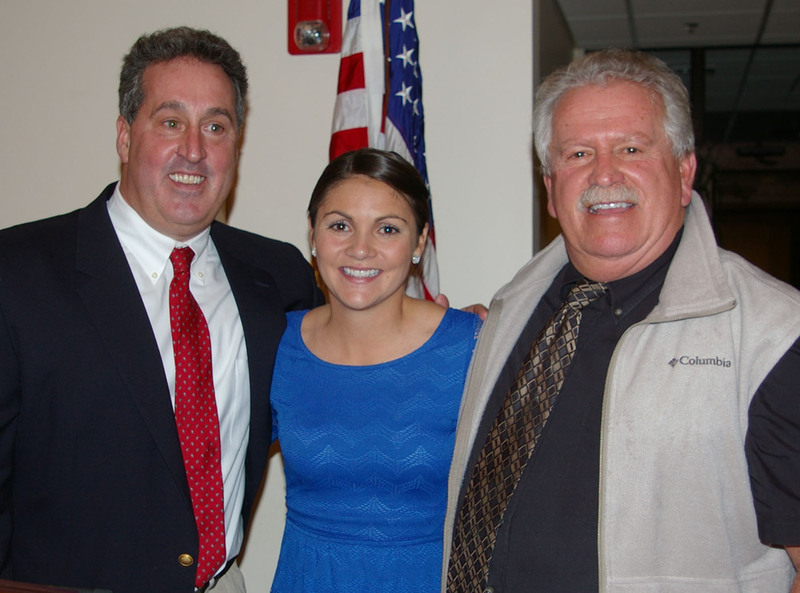 Athletic Director Gary Graziano, Liz Lima and former RHS girls soccer coach Peter Woodward. Woodward inducted Lima, Class of 2001, recognizing her as an outstanding soccer player at RHS and describing her indomitable Bulldog spirit and pride. Click here to read the entire story about the latest inductees to the Hall of Fame. 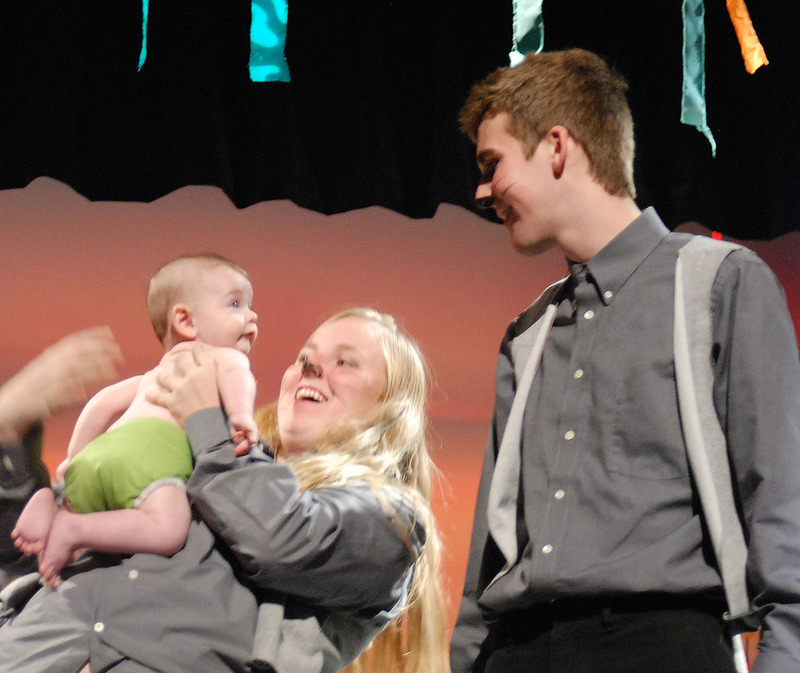 The Class of 2014, shown here as juniors, is looking to pull off the upset against the Class of 2015. Click on the photo to enlarge the picture. The annual Powderpuff football game is a fun event in which junior and senior girls compete in a game of flag football. Last year the junior team was headed by Ms. Hoyo who says that the best part of the whole experience was “just hanging out with the team.” Last year’s senior coach, Mrs. McGonnigal, led her team last year to victory by the score of 28 to 6. The annual Powderpuff game originally scheduled for the 22nd of November will be held on Monday, November 25th at the football stadium. Admission will be $5 which is the usual cost for admission to a high school football game. Veritas reporters Caitlin Yannizzi and Abby Kinlin asked each fall sports coach to choose an unsung hero. As the title implies, an unsung hero is a member of the team who may not be recognized by the media and even the fans as much as the all-stars or top scorers are. This title corrects the situation, describing the unsung heroes’ importance to their teams. Click here to see the detailed story of the unsung heroes published recently in the Veritas print edition. John Kamande and Leshon Crawford will be at the Meadow Glen Mall at 6 am on Wednesday morning, November 27th to participate in Kiss 108’s annual Turkey Toss. These juniors will represent RHS and compete against eight other high school teams including Everett High which will be going for a third straight Turkey Toss victory. Students who would like to come cheer on the boys can ride the fan bus leaving Rockland High at 5 a.m. Please see Ms. Walsh in room 121 by Friday with $5 for a seat on the bus. 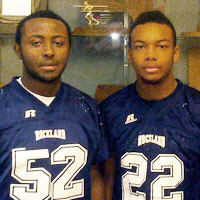 John Kamande and Leshon Crawford will represent Rockland High School at the Kiss 108 annual Turkey Toss. Photo by Gary Graziano.